Daniel Webster's "Seventh of March" speech urged Senators from all regions of the nation to compromise their positions in order to save the Union. Henry Clay of Kentucky, John C. Calhoun of South Carolina, and Daniel Webster of Massachusetts dominated national politics from the end of the War of 1812 until their deaths in the early 1850s. Although none would ever be President, the collective impact they created in Congress was far greater than any President of the era, with the exception of Andrew Jackson. There was one issue that loomed over the nation throughout their time in power — slavery. They were continuously successful in keeping peace in America by forging a series of compromises. The next generation's leaders were not. The Gold Rush led to the rapid settlement of California which resulted in its imminent admission as the 31st state. Southerners recognized that there were few slaves in California because Mexico had prohibited slavery. Immediate admission would surely mean California would be the 16th free state, giving the non-slave-holding states an edge in the Senate. Already holding the House of Representatives, the free states could then dominate legislation. Texas was claiming land that was part of New Mexico. As a slave state, any expansion of the boundaries of Texas would be opening new land to slavery. northerners were opposed. The north was also appalled at the ongoing practice of slavery in the nation's capital — a practice the south was not willing to let go. The lines were drawn as the three Senatorial giants took the stage for the last critical time. Henry Clay had brokered compromises before. When the Congress was divided in 1820 over the issue of slavery in the Louisiana Territory, Clay set forth the Missouri Compromise. When South Carolina nullified the tariff in 1832, Clay saved the day with the Compromise Tariff of 1833. After 30 years in Congress and three unsuccessful attempts at the Presidency, Clay wanted badly to make good with yet another nation-saving deal. He put forth a set of eight proposals that he hoped would pass muster with his colleagues. John Calhoun once said of Henry Clay (shown above), "I don't like Clay. He is a bad man, an imposter, a creator of wicked schemes. I wouldn't speak to him, but, by God, I love him!" John C. Calhoun took to the floor next. Although sick and dying with consumption, he sat sternly in the Senate chamber, as his speech was read. The compromises would betray the south, he claimed. Northerners would have to agree to federal protection of slavery for the south to feel comfortable remaining in the Union. His words foreshadowed the very doom to the Union that would come within the decade. Daniel Webster spoke three days after Calhoun's speech. With the nation's fate in the balance, he pleaded with northerners to accept southern demands, for the sake of Union. Withdrawing his former support for the Wilmot Proviso, he hoped to persuade enough of his colleagues to move closer to Clay's proposals. Although there was no immediate deal, his words echoed in the minds of the Congressmen as they debated into that hot summer. By 1852, Clay, Calhoun, and Webster had all passed away. They left a rich legacy behind them. Clay of the West, Calhoun of the South, and Webster of the North loved and served their country greatly. The generation that followed produced no leader that could unite the country without the force of arms. Dartmouth College pays tribute to Daniel Webster, Class of 1801, in this website which offers a biography, with special emphasis on his college activities, a timeline, texts of many speeches and writings, and portrait gallery. Much interesting and hard-to-find info fills these pages. This biography of Henry Clay from the website of his "Ashland" estate includes a timeline of important events in his life. It's also loaded with pictures! This brief biography of John Calhoun includes a portrait of the South Carolina statesman by Henry F. Darby. The webpage is from the Matthew Brady Gallery in New York. 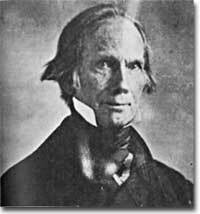 While only officially serving as a Senator for Kentucky, Henry Clay worked for an entire nation. So much so that Abraham Lincoln felt it necessary for the whole country to celebrate his life in a public homage. The town of Springfield, Illinois shut down for the event and Lincoln himself provided the eulogy. His words are presented here on this website from Abraham Lincoln Online. John Calhoun served his country in many forms other than being South Carolina's Senator. He also served as Vice President, Secretary of War, and Secretary of State. This website profiles Calhoun's life and political career with a biographical sketch, quotes from Calhoun and his peers, and a study of his political theory. Also provided is a look at the art works bearing his likeness around the Capitol building. 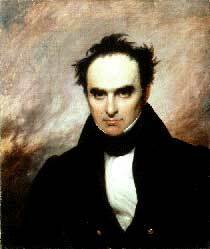 Daniel Webster was a powerful figure in American government, serving as senator of Massachusetts. This website provides an excerpt from Webster's Autobiographical Sketch written in 1829 that profiles his early political career. Henry Clay may have been known as the "Great Pacificator" but his hot temper landed him in two duels. Take a look at Daniel Webster's original notes for his "Seventh of March" speech, urging sectional compromise. John Calhoun was so sick that he couldn't read his own speech against the Compromise of 1850, but felt so strongly that he was assisted to the Senate chamber to witness the debate.